Most of Disney’s “direct to video” (DTV) projects essentially pick up where the originals stopped. On the other hand, Beauty and the Beast: The Enchanted Christmas takes a different path. The flick doesn’t really offer a sequel because most of its action takes place during the time frame depicted in the original. The program starts with a Christmas celebration that appears to be the first after the Beast and his servants returned to human form. During the gathering, they reminisce about the group's first Christmas, which occurred while the Beast imprisoned Belle in the first film. The movie's biggest strength comes from the fact that almost all members of the original cast reappear here. You name them, they're in this picture: Robby Benson's Beast, Paige O'Hara's Belle, David Ogden Stier's Cogsworth, Jerry Orbach's Lumiere, and Angela Lansbury's Mrs. Potts. This list omits some names from the original, but that's almost entirely because those characters - such as Gaston or Belle's father Maurice - don't appear in Enchanted. The only revoiced character is Chip, since Bradley Michael Pierce clearly became too old for the part in the new project; he was nine when they made Beast, so he would have been about 15 when Enchanted went into production. One certainly hopes that his voice changed enough over that span to make it unusable. However, in a casting coup that later became significant, Haley Joel Osment took over the role for this film; he'd gain much more recognition in 1999 through his work in The Sixth Sense. Actually, the cast of Enchanted really represents a step-up from that of the original since it features almost all of that film's performers plus it adds a few other strong actors in new parts. Tim Curry voices the villain of the piece, the jealous and possessive organ Forte, and he does so quite effectively; Curry naturally tends toward hamminess, and that capability serves him well in this broad part. (It also made me realize something that will only make sense to visitors of Walt Disney World's Magic Kingdom: Curry provided the voice of "SIR", the robot we met during the 1990s "Alien Encounter" attraction.) Paul "Pee-wee" Reubens appears as meek but ultimately heroic Fife; it's not much of a role, but it's always good to hear from Reubens. Finally, Bernadette Peters also appears as Angelique. Unfortunately, this minor-star-studded cast begins and ends the positive aspects of Enchanted, for the film itself is pretty weak. I didn't find it to be a terrible experience, but it offers at best a mildly entertaining knock-off of the original. Despite the Christmas theme, the plot provides nothing more than a general retelling of the first movie. Unfortunately, it does so in a much less compelling way, as all the charm and grace of Beast vanish here. It doesn't help that the quality of the animation for Enchanted seems weak at times. I didn't really expect it to be on the same level as the work seen in Disney's theatrical releases, but I still find the awkwardness and sloppiness of the art to be startling. Belle herself – the only human character - suffers from this problem more than the others; her movements look very stiff and clumsy. No, the animation never quite sinks down to Pokemon level, but it's surprisingly bad nonetheless. 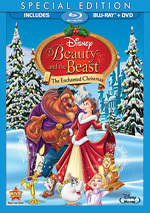 I’ve seen a lot of Disney DTV flicks at this point, and compared to some of the others, Beauty and the Beast: The Enchanted Christmas doesn’t look too bad. However, relative merits aside, the movie seems like a bland and lifeless piece of work. 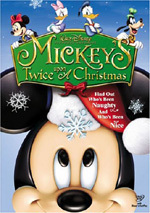 It features a fine cast but does little with them other than remake the original film with a Christmas theme. You can find worse holiday entertainment, but you can also discover many superior programs. 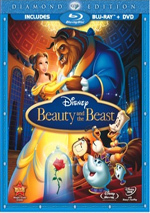 Beauty and the Beast: The Enchanted Christmas appears in an aspect ratio of 1.78:1 aspect ratio on this Blu-ray Disc. Don’t expect any problems from this strong transfer. Sharpness generally appeared quite good, with an image that usually seemed crisp despite the crudeness of much of the animation. The cheap production values occasionally meant that some small elements looked a smidgen soft, but those instances were inconsequential, as the show looked pretty accurate and tight the vast majority of the time. Jagged edges and moiré effects created no problems, and print flaws seemed non-existent. Colors looked quite terrific, with a lush palette that appeared bright and vivid. The movie generally featured a naturalistic tone, and the disc showed these hues nicely. The colors appeared clear and lively across the board. Black levels also were very good, and shadow detail seemed just fine. Despite a hint of softness in some shots, the presentation was usually excellent. Also positive was the surprisingly strong DTS-HD MA 5.1 soundtrack of Enchanted Christmas. The mix displayed a good sense of environment from the front channels. Music presented very nice stereo imaging, while effects showed positive spread and movement. Some effective localized dialogue appeared, and other elements seemed well placed and integrated. The effects blended together cleanly and meshed together well. As for the surrounds, they contributed a fine sense of atmosphere and added a good feeling of place. Occasional split-surround usage appeared as well, which helped make the whole thing all the more realistic. Sound quality came across as solid. Speech occasionally showed a little too much reverb, which could give it a slightly artificial flavor, but the lines usually appeared natural and warm, and they mostly fit the action well. I noticed no signs of edginess or problems related to intelligibility. Music generally sounded bright and smooth, but I felt the tunes and score needed a little more low-end power; a few of the numbers came across as slightly anemic. Effects made up for that weakness, however, as they presented nice bass response. These elements sounded clear and accurate, with no issues related to distortion or other concerns. The effects contributed a lot of rich low-end material and packed a surprising punch at times. Ultimately, Enchanted Christmas presented some fine audio for the most part. How does this Blu-ray compare with the Special Edition DVD from 2002? The audio was more vibrant and dynamic, while visuals seemed tighter, brighter and clearer. Given the film’s low-budget roots, I didn’t expect much from the Blu-ray, but it offered improvements in both picture and sound. Note that the DVD and the Blu-ray use different aspect ratios for Enchanted, as the DVD went 1.33:1. I suspect that 1.33:1 represents the original, intended ratio and the 1.78:1 crops it, but I can’t say that for certain. I saw no shots that seemed “wrong” in terms of framing, so I witnessed no obvious signs that the Blu-ray had marred the original. 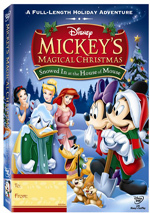 The 2011 disc includes most of the same extras as the prior release plus one new addition: Disney’s Sing Me a Story with Belle. This runs 22 minutes, 56 seconds and presents an episode of a mid-1990s Disney Channel series that mixed live action, puppets and animation. Belle (Lynsey McLeod) tells stories and sings tunes that support the notion that we should “stick with it – don’t give up”. It’s interesting to see out of curiosity, but it’s not a particularly good program. If you’ve seen those video programs that show a roaring fire on your TV, you’ll know what to expect from Enchanted Environment. This provides two different fireplace options and also lets you choose to listen to music, sound effects, or music and sound effects. It’s inconsequential but kind of cute. We find a music video for Play’s “As Long As There’s Christmas”. The clip offers the standard bland combination of movie clips and lip-synching – yawn! The song itself is nothing more than limp and generic teen pop. Between the two areas, we hear from many Enchanted participants. We find comments from director Andy Knight, actors Paige O’Hara, Robby Benson, Jerry Orbach, David Ogden Stiers, Tim Curry, and Bernadette Peters, assistant animators Judy Piesma and Lisa Harlton, assistant director William Speers, effects supervisor Dan Turner, effects animator James Klow, background artist Ken Gipapa, backgrounds supervisor Gabor Szakany, CG animation supervisor Paul Hunt, and composer Rachel Portman. “Click the Mouse” covers the basic process of creating an animated program and provides a reasonably clear look at the work involved. It doesn’t give us much that seems terribly special, though the actors add some interesting insight into the public reactions that come with being Disney voices. Disney’s Song Selection basically acts as an alternate form of chapter menu. It lets you jump to any of the film’s six song performances, and it also allows you to show on-screen lyrics. Sing Along with the Movie expands the latter concept, as it presents the words while you watch the movie. Neither does anything for me, but someone might like them. One cool aspect of “Sing Along” it turns the words from standard font to italics as the song progresses, which makes it easier for kids to follow along with the lyrics. The disc opens with ads for Lady and the Tramp, Brave, and Treasure Buddies. These also appear under Sneak Peeks along with promos for Disney Movie Rewards, Disney parks, Prep and Landing, Cinderella, and Secret of the Wings. A second disc gives us a DVD Copy of Enchanted Christmas. This is a regular retail copy of the film. At times, Beauty and the Beast: The Enchanted Christmas offers some mild entertainment, but for the most part it seems pretty bland. It certainly doesn't live up to the level of the original film. The Blu-ray delivers solid picture and audio as well as some minor supplements. Leave this one for die-hard Beast fans, as it’s a generally forgettable effort.